Both tea tree and witch hazel are renowned for their deep cleansing, calming properties and a combination of the both will help soothe, heal and clear blemish-prone skin without over-drying. 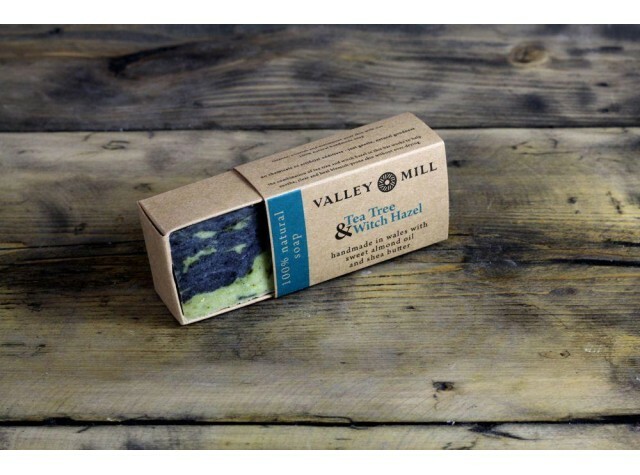 Valley Mill natural soaps contain do not contain artificial colours, preservatives or additives and are free of parabens and SLS; they are just full of natural goodness. They're cruelty free too! Shea Butter, Sweet Almond Oil, Coconut Oil, Mango Butter, Olive Oil, Castor Oil, Tea Tree Essential Oil, Witch Hazel Essential Oil, Spinach Powder, Activated Charcoal Powder.